Back cover blurb: Each girl survived an unthinkable horror. Now someone wants them dead... They were called The Final Girls. Three young women who survived unimaginable horror. Three victims of separate massacres grouped together by the press. Three strangers bound by similar traumas. Lisa. Quincy. Samantha. When something terrible happens to Lisa, put-together Quincy and volatile Sam finally meet. Each one influences the other. Each one has dark secrets. And after the bloodstained fingers of the past reach into the present, each one will never be the same. Final Girls is a book that I've had on my virtual shelf for such a long time, waiting for the chance to be read properly - because I'd heard so many good things about it, that I wanted to take the time to read it slowly. Final Girls is one of those novels, those page-turners that you just can't get enough of. It is most definitely not a slow read. It is brilliant. Quincy Carpenter aka Quinn is a successful baking blogger, living with her partner in a plush apartment that is worlds away from the tragedy of her past. Quinn is also a 'final girl' - the lone survivor of a brutal murderous attack in which of all her college friends were killed. So named after the last often lone female standing in horror movies, Quinn shares this accolade with two others, Lisa Milner and Samantha Boyd. She has never met either of them, but has kept tabs on them via the media. When something terrible is reported to have happened to Lisa Milner, Quinn fears that she and Samantha may be in danger. Samantha turns up at Quinn's unannounced just days later and both of their lives are turned upside down once again. 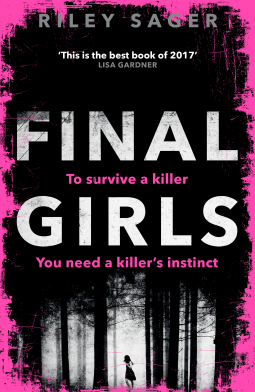 Final Girls is an unexpected triumph of a novel - not to be missed! Final Girls is available now via Amazon online and all good book shops.